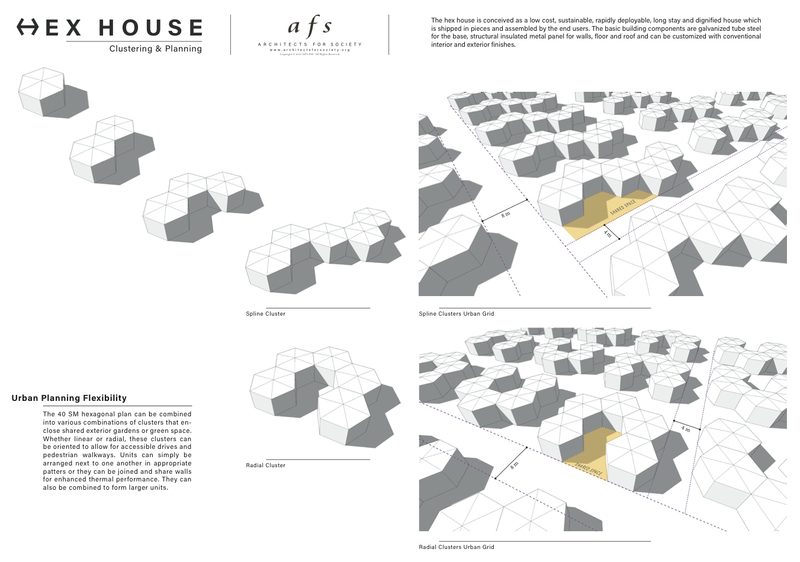 as you are going to read this project is really really helpful, very much needed, and has an amazing plan to solve the rather desperate and sad refugee housing situation. isawsomethingnice.ch has donated some money to help reach their goal. please take a moment and read more about this project and see if there is anything you can do for it. 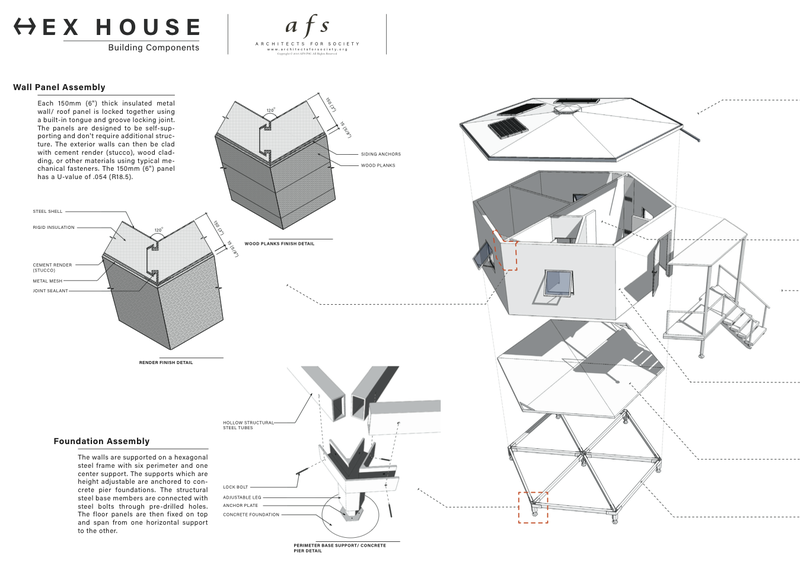 with the prevalence of refugee displacement across the globe, Architects For Society has embarked on designing housing solutions that help alleviate and overcome many of the problems associated with current temporary refugee shelters. the Hex House is not only low cost and can be shipped in pieces to be easily assembled by the end user, equally as important, it is also long term and dignified! 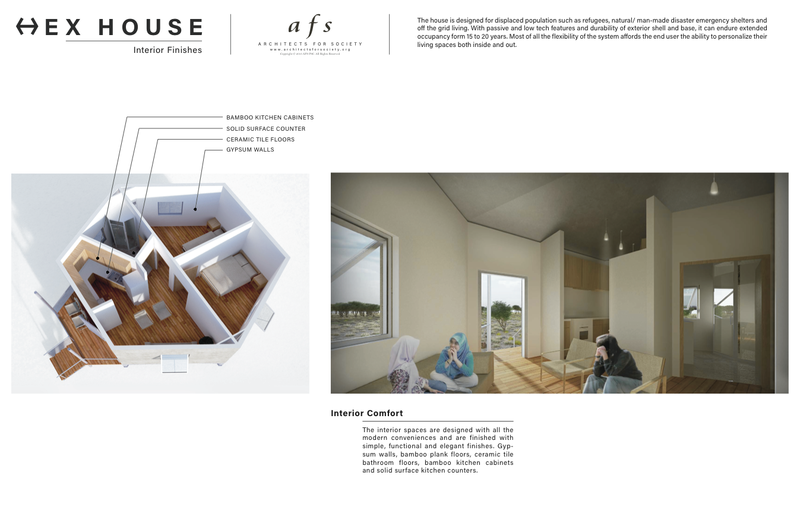 as a group of allied professionals from the US, Europe and the Middle East, AFS is a non-profit design practice with a mission to enhance the built environment of disadvantaged communities through innovative architecture and design. 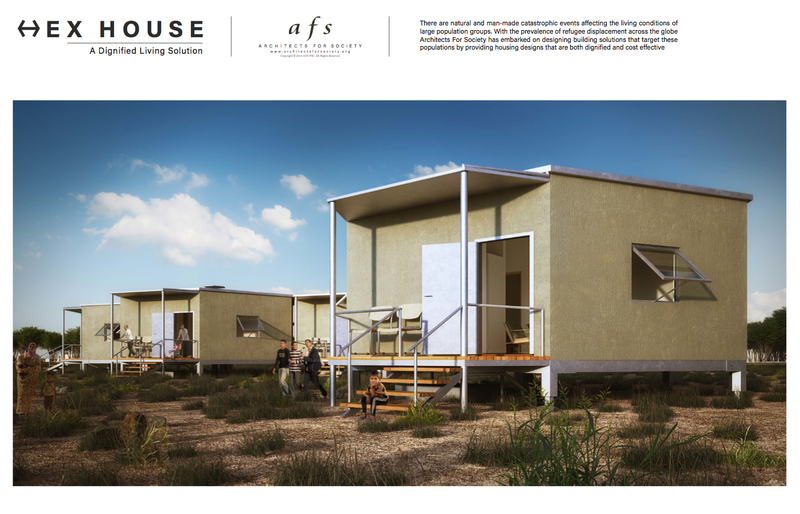 AFS recently worked with Chalmers University in Gothenburg, Sweden to develop a rapidly deployable shelter prototype for Syrian refugees in Alzaatari Camp in Jordan. this collaboration was the impetus for developing the Hex House prototype, which is based on the insulated metal panel technology that’s widely used in emergency shelter construction in the camp. 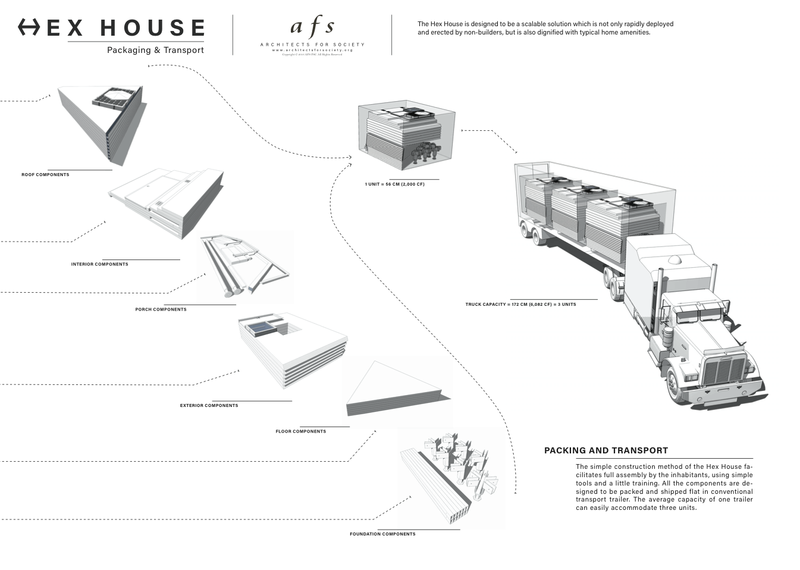 the hex house is conceived as a low cost, sustainable, rapidly deployable, long stay and dignified house which is shipped in pieces and assembled by the end users. the basic building components are galvanized tube steel for the base, structural insulated metal panel for walls, floor and roof and can be customized with conventional interior and exterior finishes. the inherent structural stability of the hexagonal form and the rigid construction of Structural Insulated Panels (SIP) precludes the use of added structural support. the wall & roof panels are designed to be self-supporting and when locked together with integral tongue & groove joints, form a rigid structural shell. the 40 SM hexagonal plan can be combined into various combinations of clusters that enclose shared exterior gardens or green space. whether linear or radial, these clusters can be oriented to allow for accessible drives and pedestrian walkways. units can simply be arranged next to one another in appropriate patterns or they can be joined and share walls for enhanced thermal performance. they can also be combined to form larger units. the 40 SM (431 SF) unit is a compact two bedroom home with all the amenities intended for small families. Interior walls are not attached to the ceiling to accommodate customization of layout and provide natural ventilation. 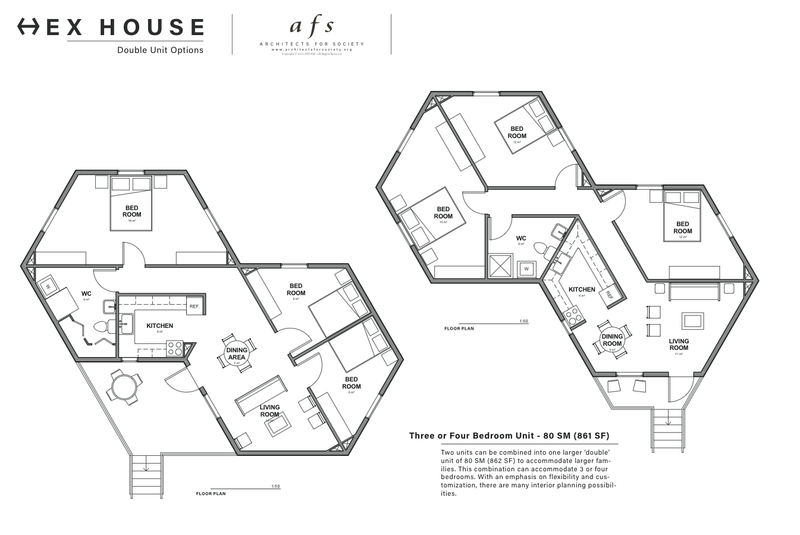 two units can be combined into one larger ‘double’ unit of 80 SM (862 SF) to accommodate larger families. this combination can accommodate 3 or four bedrooms. with an emphasis on flexibility and customization, there are many interior planning possibilities. the walls, roof and floor are fabricated from rigid foam insulation sandwiched between two sheets of steel known as Structural Insulated Panel (SIP). all exterior wall panels have the same dimension 3M (9’-10”) x 4M (13’-2”) with some variations for door and window openings. the roof and floor panel sizes are also standardized, insuring efficiency in fabrication, packing and transportation. each 150mm (6″) thick insulated metal wall/ roof panel is locked together using a built-in tongue and groove locking joint. the panels are designed to be self-supporting and don’t require additional structure. the exterior walls can then be clad with cement render (stucco), wood cladding, or other materials using typical mechanical fasteners. the 150mm (6″) panel has a U-value of .054 (R18.5). the walls are supported on a hexagonal steel frame with six perimeter and one center support. the supports which are height adjustable are anchored to concrete pier foundations. the structural steel base members are connected with steel bolts through predrilled holes. the floor panels are then fixed on top and span from one horizontal support to the other. the simple construction method of the Hex House facilitates full assembly by the inhabitants, using simple tools and a little training. all the components are designed to be packed and shipped flat in conventional transport trailer. the average capacity of one trailer can easily accommodate three units. rain water is carried through an integrated gutter and down a downspout system. it’s filtered into a sub-grade storage tank where it’s manually pumped back into the house by point of use hand pumps to be used for washing and flushing. there is also a refillable potable water storage tank below grade that’s also manually pumped. 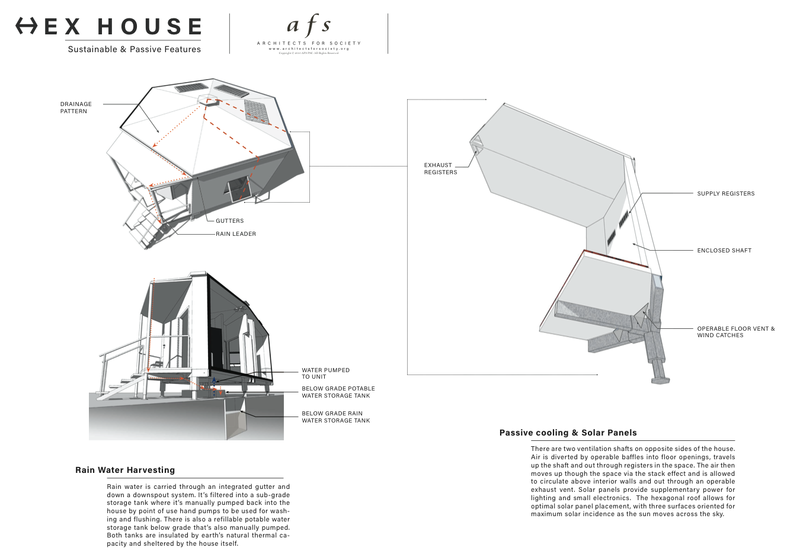 both tanks are insulated by earth’s natural thermal capacity and sheltered by the house itself. there are two ventilation shafts on opposite sides of the house. 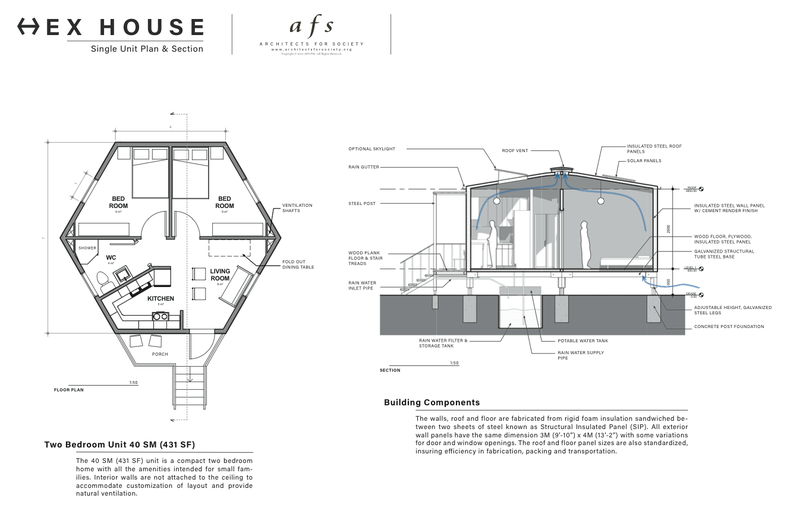 air is diverted by operable baffles into floor openings, travels up the shaft and out through registers in the space. the air then moves up though the space via the stack effect and is allowed to circulate above interior walls and out through an operable exhaust vent. solar panels provide supplementary power for lighting and small electronics. the hexagonal roof allows for optimal solar panel placement, with three surfaces oriented for maximum solar incidence as the sun moves across the sky. the interior spaces are designed with all the modern conveniences and are finished with simple, functional and elegant finishes. gypsum walls, bamboo plank floors, ceramic tile bathroom floors, bamboo kitchen cabinets and solid surface kitchen counters. 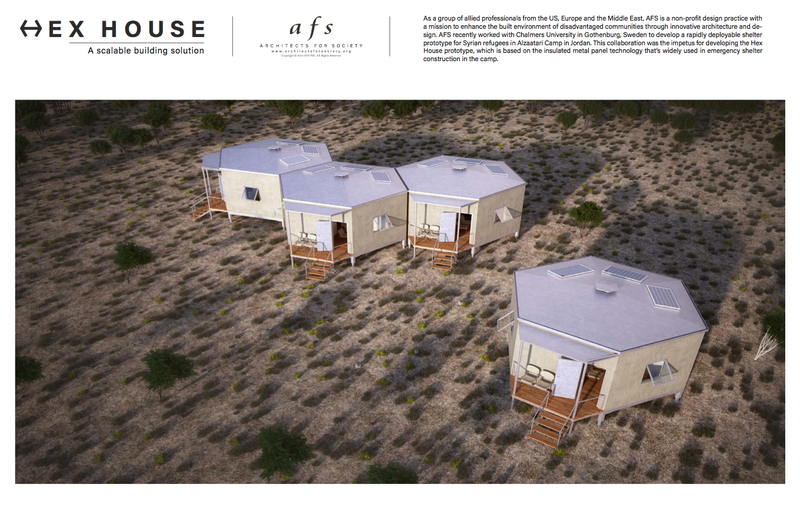 the Hex House is designed to be a scalable solution which is not only rapidly deployed and erected by non-builders, but is also dignified with typical home amenities. the house is designed for displaced population such as refugees, natural/ manmade disaster emergency shelter and off the grid living. with passive and low tech features and durability of exterior shell and base, it can endure extended occupancy form 15 to 20 years. most of all the flexibility of the system affords the end user the ability to personalize their living spaces both inside and out.